Syndiant and Foryou Multimedia Electronics recently demonstrated a prototype pico projector so small that it fits in a shirt pocket but offering a higher resolution than is typical of pico projectors--1,024 x 600. The pico projector uses Syndiant's SYL2061 panel to achieve the 1,024 x 600 resolution and is designed for use with laptops, netbooks, and other mobile devices. The companies said this pico projector also provides adequate color quality and brightness, although specifications for color and brightness were not announced. 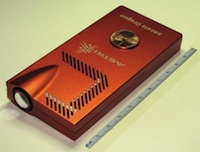 The prototype pico projector was developed in collaboration between Syndiant, Foryou Multimedia Electronics, and Hong Kong's ASTRI R&D labs. According to Syndiant, the next goal is to develop a high-definition pico projector.